Welcome to the new UK Toy Discussion! It's that time once again! A new season with a new mountain of toys to try to collect! Ninja Steel toys started appearing in the last week of June 2017 in some stores and online, with the full release for all retailers landing in July. Because the 2017 movie toys and previous Legacy toys are still being sold and shipped to retailers, I'll also be adding them to the list below. With all that said - discuss away, everybody! Last edited by Morgan Lamia; November 9th, 2018 at 04:00 PM. To another year of slow, unfulfilled releases ahead! Jk jk. But all jokes aside I'm looking forward to see what we have in store Legacy wise. Especially since BoA seem open to new ideas like Zeo or moving on from repaints. I saw a Youtube ad for Ninja Steel at Smyths yesterday, if that's relevant. I can't see that Fortress Zord selling very well for £120. It looks very cool, but I imagine the price - and size - will put most people off. A1 Comics has said that they're getting Legacy Power Sword, B&G Titanus and some other Legacy restocks during July. I dropped in at the Liverpool Smyths earlier and the Ninja Steel Action Heroes are on "2 for £15" (the movie Action Heroes are in the same deal). They had everyone except White...who's nowhere to be seen on Smyths or Entertainer online either, so maybe that one's gonna be out in a future wave...? It's also 2 for £15 on the smyths site as well. Also £5 of when you spend £25 with JUL5 voucher code. Last edited by rowie4life; July 6th, 2017 at 07:18 AM. Just got a pretty damn good deal from Smyths online (there isn't a store near me). 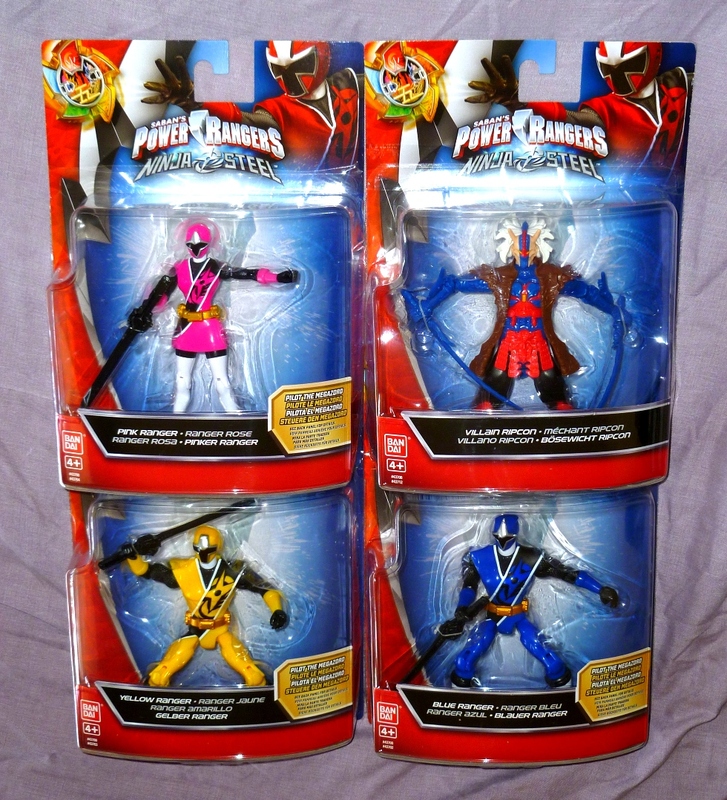 Picked up the 5" figures of Ripcon, Pink, Yellow and Blue Rangers, with the 2 for £15 deal, free shipping because it was over £20, then used the "JUL5" promo code for £5 off... Bringing the final total price with shipping to £25 - £6.25 per figure. Not bad. That's a discount of £14.96 overall. If you want to use that £5 off code, I would jump on it now. It ends tomorrow (11th). Total needs to be £25 or over, however. Last edited by Red Rock; July 10th, 2017 at 12:27 PM. My local Smyths was selling the DX Bullrider Megazord and Gold's guitar/sword/gun (I can't be bothered to look up the name) so it seems we're getting some of Wave 2 mixed in with one. Also, anyone else hoping the Ninja Coins will be for sale at LFCC this month? It's been quite good the last few years, Smyths get exclusive rights to the 2nd megazord for a few months before it becomes widely available later in the year. Happened the previous few July's with Q-Rex, Ptera Charge and Titano Charge Megazord. Means we can play catch up if we want to. Listings for the Legacy Power Sword and Black Edition Titanus are now up on Smyths. The Power Sword is priced at £150 and Black Titanus at £130. In personal news - These arrived from Smyths on Wednesday. As I said above, I got them for a good price, so I'm happy. Here's hoping that White starts appearing soon. It's a little strange that no-one's been listing her yet. If anyone spots her in-store, let me know so I can add her into the first post. Last edited by Morgan Lamia; July 14th, 2017 at 02:40 AM. Lol, that's definitely 100% not happening. When they first added the listings, the photos for the Coin Set and the Power Sword were swapped around. They swapped them back to the correct way this afternoon, but not fully, so there's still a Coin Set pic left on the Power Sword listing, and a Power Sword pic left on the Coin Set listing. Makes sense. Just some unrealistic hoping ahaha. Thanks for clearing that up. Just can't believe the 150 price tag. I didn't expect it to be more than Saba but I guess with the decreasing point it makes a bit of sense. Last edited by Red Rock; July 14th, 2017 at 02:15 PM. Massively surprised Tesco got that target exclusive 6 pack! basically what I spent to import it though. I seen they're reducing the price on the movie toys. They're probably making room for ninja steel toys. The lion fortress zord is listed but not available yet.